Finally done with everything! Set up the exhibition for the degree show. Got in touch with Nathan Stornetta for a hat-trick and he made some great music for the film. Here is a trailer to the new short! I decided to go for on "One Smile Fits All" as it derives from the phrase "One size fits all" which makes the shop connection. Most importantly, to say that "One smile fits all, and thats your real one." It has the "come buy from us" feel and makes it more relevant to the whole buying smiles theme! I also wanted to put clouds in the scene so designed some quick models and increased incandescence on them so they fit in more in the background. Quickly rigged a toy duck to make them movable enough to suit my purpose. That was fun! The renders were only taking about 30-40 seconds for each frame which is great! - When the character comes out with small smile, cut in to his face to show small smile, cut back out to show can splash. - Make hand look as if it goes into purse and comes out. - Bit of anticipation up before he falls into hole then make fall slightly faster. - When skipping, he needs to go out of shot before cut to ice cream licking. - The girls point of view shot of the ice cream on her dress is confusing. - Make the girl look more angry in the long shot as man backs away. Some parts of the animation turned out decent like when he spots her and when he steps back from the car. 1. There wasn't enough control with Maya's sun and sky. I wasn;t able to control intensities the way I wanted and it was always either too bright or too dull. Also, there wasn't a way of removing shadows, which seems a bit silly. A way to go about it would be to replace the automatic sun light with your own direction light, but it wasn't the same. 2. To use it, I would have to have final gather on to get good quality and the renders were taking a minute and a half. I just didn't have enough time to get that done. Was trying to decide on if I should give the character a beard or not. I really liked the beard as it added to the characters misery (no judgement on anyone!) but decided against it as I found that he is less relatable to. 09/05/13 This is the rough cut crit that we had to present in class today. I incorporated Paul Chung's feedback and also suggestions from my session with Brad Silby and Emma Ewing. Its much shorter and clearer now. The general opinion was that I'm headed in the right direction and that I should keep going. "Shot1: Swap the walk cycle for the other one that you showed me. Shot2: I'd have him look up as he walks along and then stop, rather than stopping and then looking up as the latter suggests he was planning to go to the shop already. Shot4: Start with his hand closer to his wallet, and his head looking up. The previous shot was showing his viewpoint so it's a bit jarring to see him looking at something else straight after. He could have got his wallet out whilst looking at the sign but not already be looking at the money. I'd also get rid of the head nod before the shoulder shrug. More than one gesture here will look very busy. Shot5: As I mentioned the camera move looks quite artificial to me so I'd either avoid it or replace it with something simpler like a slight zoom. Shot6: I think you need a gesture between feeling his face and looking at the board to emphasise his realisation/frustration at what just happened. Clenching his fist in anger for example. Shot10: Avoid having both arms doing the same actions simultaneously. I'd have him wipe his face with his forearm and then briefly touch his mouth with his other hand. Shot11: I'd suggest having him step into shot so that you could see his arm and part of his back. You could then start the next shot's action in this one and they would flow better together. Shot12: Start with his hand deep in his pocket, leaning over as he rummages around for the money. Shot15: Love his expression in this and the gusto with which he eats the ice cream. I'd arch his back a little so his shoulders where further back and there was more of a curve to his spine. For continuity with the next shot, he should look slightly to the side when he notices the woman, rather than straight ahead. Shot17: Really like the way you've conveyed the woman's surprise turning into disgust so quickly. Good work. I'd say the shot should finish with her looking back at her book though. Shot18: Rather than dropping off because he held it out too long, I think it should come off as the result of a second more insistent offering. I.e He should jab the cone towards her. As it is, this shot is a bit dull as you have to wait so long for something to happen. It's a key part of the story so you have to make sure that you've got the viewer's attention. Shot19: Her reaction is good but it should be more instantaneous. you'd feel the cold ice cream before you saw it. Shot20: I don't think this shot is needed. It's quite clear what's happened so you don't need the close up of the ice cream to explain it. Shot22: Have his eyes darting about so that he looks panicked. Also have him start to lean back and draw himself in so that his body language looks less open even though he's still smiling. Shot25: The camera should be much closer in on the old lady in this shot and for continuity, the two characters should be closer together. I'd start with the main character stepping into shot. Shot26: You need to show the collision between the stick and foot in this shot. Shot27: His fall is good but the old lady has to be visible in this shot as well. Though she could be stepping back out of shot, recoiling from the collision with her stick. Shot28: He needs to rebound more from his fall and the old lady should be still reacting to him tripping over her stick at the start of the shot. Shot29: He should go to a different position after he's been trodden on. Shot30: I don't think the woman should pause before hitting him with the ice cream. It would have more force if her stepping in and the jab with the ice cream where all one fluid movement. She could also turn with a flourish and walk off primly. I'd also suggest angling the main character so that more of his face is visible. You can also cut this slightly before he's completely out of shot. Shot34: Rather than punching the wall have him brace his hand against it so that he can fling the door open with force." I feel really grateful for the feedback and can't wait to incorporate these changes. Although there might not be enough time to do everything that was suggested, but I'll try to do my best! 1. Character Based Systems - This pipeline has teams for each character in the movie. So there are character leads, who make sure that the character remains consistent throughout the movie. They are in charge of their respective character animation teams, who work on that character only. 2. Sequence based systems - The pipeline has teams based on shot sequences in the movie. There is a supervisor for each animation sequence who has animation teams working for that sequence and is also responsible for collaborating with supervisors from other departments (VFX, lighting, etc.) to make sure the quality of the sequence remains consistent throughout. This pipeline might not be preferable for character performance consistency but is better form character dynamics of different characters in the shot. 1. Check out the whole sequence in pre-viz. Make sure how your shot connects to the shots before and after it. 2. Find out all available info about your shot, tests, already animated scenes, live action references. 3. 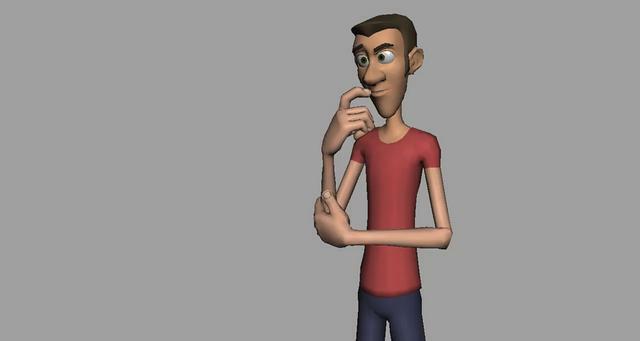 Find out the animation style - cartoony, realistic, etc. We were suggested to watch a few Jerry Lewis for acting references and Jimmy Slolina for lip-sync references. This is my favorite Jimmy Slolina, such great acting! He basically suggested that a lot of shots be cut short and some changes with camera. 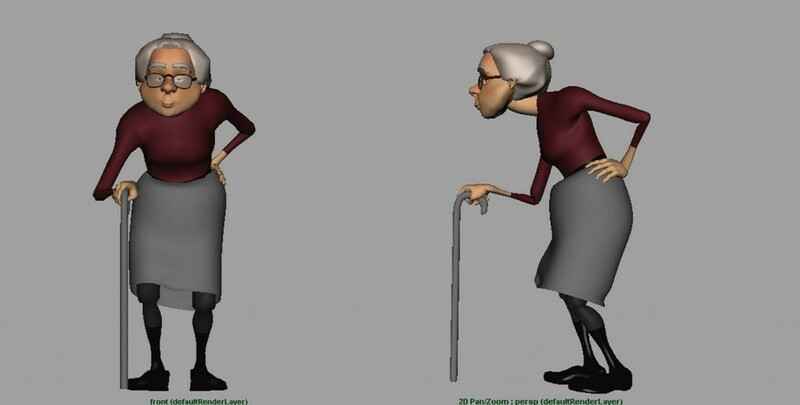 He also suggested to make clear the reference position of the old lady in comparision with Maroon. He also told me to get rid of all the empty frames in the shots, before or after the character is in the scene. My story has three characters - the main character, Maroon, the girl at the park and the old lady. 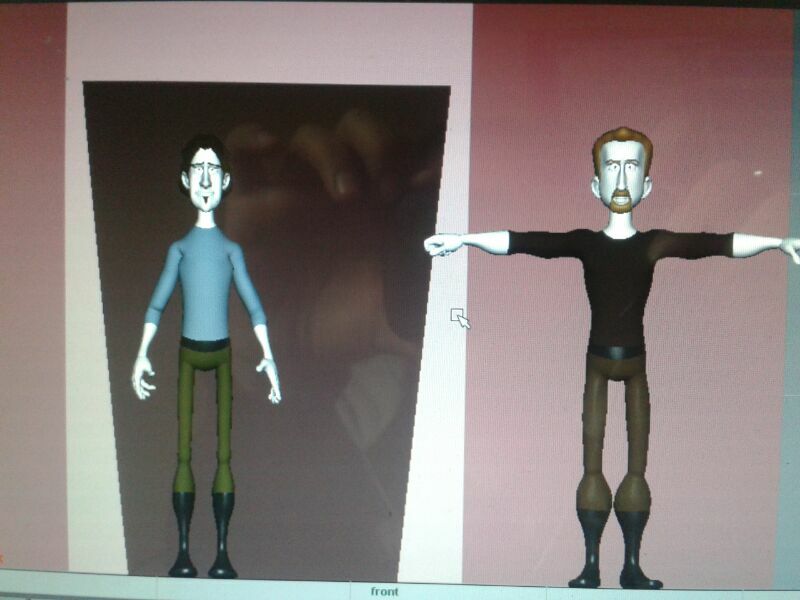 When I started developing the characters, I was really inclined towards using a modified version of AnimSchool's Malcolm rig for Maroon as I had seen some wonderful animation using the rig and I wanted to use this project as an opportunity to create good animation to put in my reel. I was also experimenting with different kinds of hairstyles to see which one would add more character. Unfortunately, after that I realised that the shape of Malcolm's body (long and stretchy) did not go well with the backgrounds(short and squarish). So I decided to switch to my well trusted Morpehus rig. It seemed like the Morpheus rig model better belonged in this environment. There are still a few glitches that wouldn't fix, but I managed to work around them! When I was planning on using Malcolm, I had thought about modifying the Bonnie rig for the old lady. Unfortunately, it wasn't possible to modify Bonnie's body to make it less curvaceous and older, as hard as I tried! So I had to resort to modifying Morpheus again, and I'm so glad I did! It works so much better now! She reminds me a lot of my cute grandmother, who I took time to observe (not in a creepy way! ) over the Easter break. I had to model the skirt, attach it to the rig and work out the blendshapes so that the knees wouldn't intersect with the skirt geometry. Its not perfect, but it will do, as she is only there for a few shots. I was inspired by some suggestions that I should keep the backgrounds of my movie simple like the Spanish pre-school animated television series, Pocoyo. I thought it was a good idea and would help me focus on the animation more. The textures and renders are great and have a very tactile clay-ish feel to them. However, my backgrounds couldn't be THAT simple as they had some essential elements (as seen in my animatic) like the shops, the car and the park. I wanted to keep it as minimalistic as I could. So I modelled some stuff in Maya that I thought the backgrounds should look like. I started with the trees in the park and basically played around with simple shapes and color combinations to get a result I liked. I liked the idea of the whole world in the movie to be a bit surrealistic ‒ similar to reality but not close enough. These are a few of the trees that I liked the most. I think my favorite is the one with the pentagonal indentations. 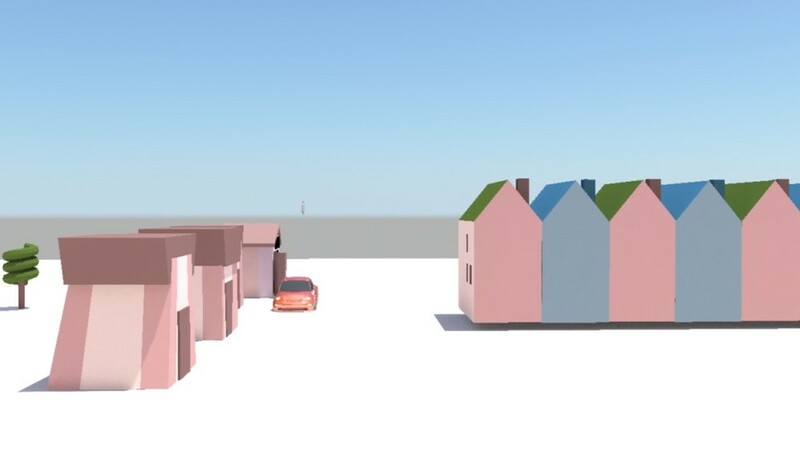 I also modelled a few houses that I thought might appear in the background as he is walking his walks. I think the idea was to have houses that I could use to look flat from one angle if I needed to. I could place them straight on in from of the camera so that they remain simplistic and don't distract from the shot. I wanted to try out some color options, maybe to change in the background as his mood changes from sad to happy. The most important part of the backgrounds was the shop itself, where he would go to buy his smile. I really wanted the shops to be inspired from circus tents, as the commodity sold in my story, smiles, wouldn't really be found at just another shop. It had to be "different". Fun. Inviting. The colors on circus tents are very bright and attractive and inspire curiosity. "Come in..see all these unreal things we have!" So I tried my hand at creating shops which would remind you of circuses. I wanted the same things for the shops as I did for the houses, to be flat from one angle if I needed them to be. I still need to work on colors but these are some I really like. I still need to decide on which one I'm going to use and it would still need a banner and rate posters, but I'm happy with these designs. It will be important to make sure the character fits into this world, and doesn't seem like he's out of place. 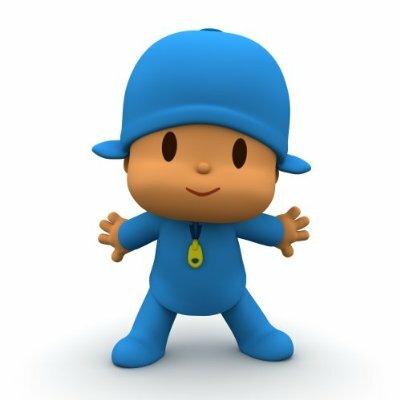 Also, here's fun example of Pocoyo! I decided to remove the kite-flying scene, as it seemed like it could do without, and would also help make the movie tighter, and also the second car splash as it ends up looking a bit repetitive I think the cameras still need work, but I will try to tweak them in 3d as they always end up looking a bit different than in 2d drawings. Also, Ioli showed me this wonderful piece of art with people walking around wearing devices to help support their smiles. I love the disconnection between the eyes and the face! Thought it was a wonderful statement on the social importance of smiles, and the need to smile even when you don't feel it. I would love to know who its by. Unfortunately its very hard to trace stuff on the internet if you don't know the name of the artist or the piece. Developing The Story - Lets see some pearly whites, Maroon! I decided to settle on this story as it had potential of creating situations that would be great to animate! Also, showing sadness in his eyes while he was still smiling would be a good challenge. On my way back from school one day, I was planning on researching to develop this story more, so stopped at the coffee place to prep myself for the night with some mocha when I got the idea. What if Maroon, my character, sees a shop that sells Smiles in different sizes - Small, Medium and Large (contemplating on changing "Large" to "Ever-lasting"). He goes in, buys the smallest one, and comes out with a smile on his face! He is happy. Suddenly car passes by and spashes water on him. He is annoyed and his smile wears off (it was the cheapest one). So he quickly goes in to buy another, larger one. He comes out, skips in his happiness with his big new smile until...he falls down a manhole! This time he decides to buy the largest one, which is not supposed to come off. He is really happy, skipping in slow motion. feeding the ducks in the park, having many icecreams, hitting on girls.. But then..he goes upto a girl who struck his eye and while offering her one of his icecream cones, spills it on her. Seeing his big smile, she thinks he did it on purpose. Trying to back away from that situation, he trips on an old lady's cane and falls down hard. To make matters worse, the old lady, to avoid inconvenience, takes the easy way and simply walks over him. He is so frustrated that he gets up to go back to the shop to return the everlasting smile. He comes out, sad again, but then smiles of relief. 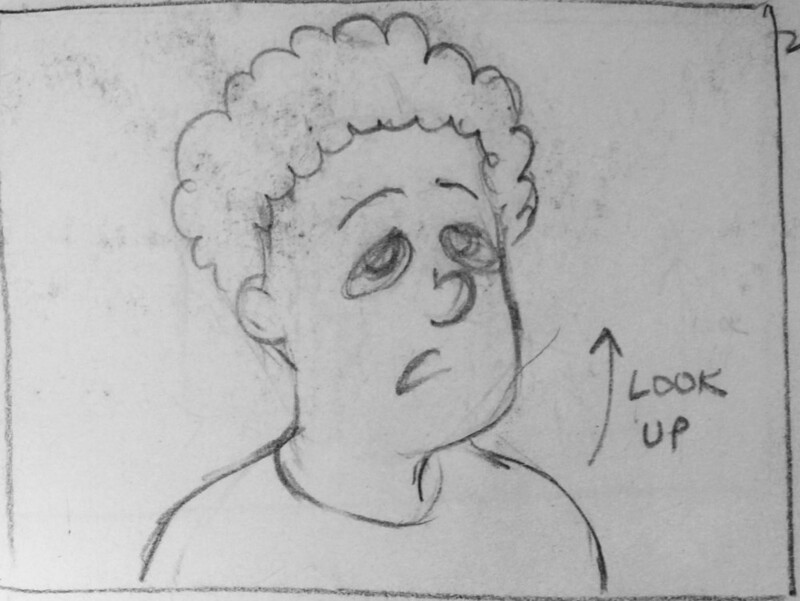 There are more situations i can add to the story, slipping on a banana peel, bird pooping on Maroon's head, etc., but I will try and make the animatic to see how long it comes out to be. I wasn't very fond of this idea as it didn't give any solutions in the end. 2. Its not money, and the pursuit will make you crazy - One angle that I really liked (which is not exactly comical) was Maroon having withdrawal symptoms after he is unable to procure money to buy more smiles. Splitting in another direction from the previous storyline, I was considering that after he keeps trying to find money unsuccessfully, he sees this big pile of money in front of him. He is surprised and obviously starts to walk towards it to get some. Then suddenly, the pile starts to move as he gets closer. Maroon starts following it. It ends up in a wild goose chase. We are then at the edge of the cliff, and the money all falls down from the edge. Our character is very seriously contemplating whether he wants to jump off after it, and he does. Then there are two possible endings - Either A, on his way down, he sees the beautiful world around him and snaps out of it, but its too late and the fall kills him. Or B, that on his way down he sees the world, and right before he crashes, he sees other happier versions of him, 5 or 6 or them that he was always trying to be, and they are all stretching out their arms with smiles on their faces to catch him into death. I suppose to say that what he couldn't achieve in life, his hallucinations made it seem like he is doing so by dying. This would possibly be a statement on suicide. Obviously, the interpretation be open and would lie with the audience's perspectives. As much as I liked this version, I don't have the means and the time to do justice to it, and at the same time have something good to show in my 3d reel. It would require really good effects when he is falling down the cliff and observing the world. But I will definitely consider creating it when I have some more expertise! I wanted to finish it before Easter break as I would be going back home but I don't think I will be able to. It will have to wait until after the final project, but its definitely going in my showreel! 22/02/13 Just like the previous two movies, Ioli helped us take animation references for this film. It was really fun as this short is quite cartoony and needs a lot of exaggeration. From my previous shorts, I am also learning to push my acting as much as I can to exaggerate it enough. Although I will have to retake my references as I go, its always still a good starting point to understand weight and anticipation. 05/03/13 We had a two week collaboration with the first year students and I worked with Natalia. I showed Natalia my backgrounds and asked her to design the main Smiles shop. I had a few options already but I wasn't sure how I would go about it. Taking these as reference, she designed the following shops. I really liked the colors on the second one and decided to use that as my final shop, without the boards on the roof. Here is a quick render test I did on that one by using Maya's ambient occlusion shader. I decided to have my character "Joe" drink the potion, wait, become crazy angry shoving things off of a table, snap back to his normal self, act apologetically at his behaviour and turn into a bunny that hops away! [youtube]https://www.youtube.com/watch?v=W2WpmWYZeyg[/youtube] There was some problem with my "table layer" that didn't show because of a demo version of Flipbook that only allows two layers. 17/01/13 This week we had An Vrombaut as a guest lecturer. She is the creator of the animated TV series 64 Zoo Lane and Florrie's Dragons. Talking about her own career, she gave some really good insight into how to go about making your own TV series. It is very important for the story to have structure, character and authenticity. After you find a UK broadcaster (the toughest job), who will only sponsor about 25% of your budget (might vary), you need to find sponsorship for the rest of your budget, which might even come from international sources who would be interested in airing your show. Here is a rough format of a Writing Bible: A. Episode Structure 1. Title Sequence 2. Intro Sequence - Details 3. The Story - Narration, Episode Story, Dialogue, Moral, DOs and DON'Ts 4. End Sequence 5. Credits B. Settings Contains environment and placement settings with layouts and visuals. C. Character Individual detailed descriptions of each character and their personality with illustrations. It was really lovely to see the writing bible for an episode 64 Zoo Lane with beautiful illustrations of characters in their settings.